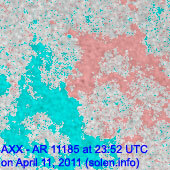 Last major update issued on April 12, 2011 at 04:30 UTC. Minor update posted at 14:40 UTC. The geomagnetic field was quiet to active on April 11. 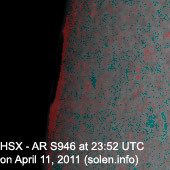 Solar wind speed ranged between 308 and 464 km/s. A high speed stream originating from an extension of the southern polar coronal hole began to influence the geomagnetic field before noon. Apart from southerly swings at 16 and 19h UTC (at ACE) the interplanetary magnetic field has been predominantly northwards. The relatively weak disturbance mainly affected the mid latitudes with polar magnetometers recording quiet conditions. 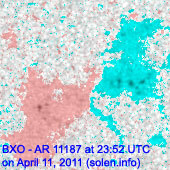 Solar flux estimated at 20h UTC on 2.8 GHz was 105.8 (increasing 4.3 over the last solar rotation). The planetary A index was 9 (STAR Ap - based on the mean of three hour interval ap indices: 9.3). 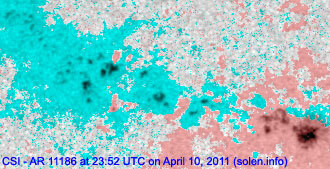 Three hour interval K indices: 20123432 (planetary), 21223322 (Boulder). 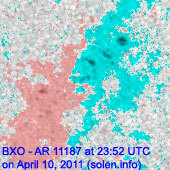 Region 11185 reemerged with a single tiny spot. Region 11187 decayed slowly and quietly. 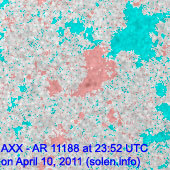 Region 11190 rotated into view at the northeast limb on April 8 and was numbered 3 days later by NOAA/SWPC. 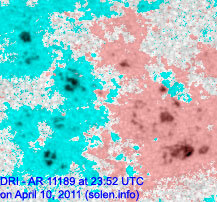 The region developed fairly quickly on April 11 with mixed polarities observed in the intermediate spot section. Further development could cause a magnetic delta structure to develop. 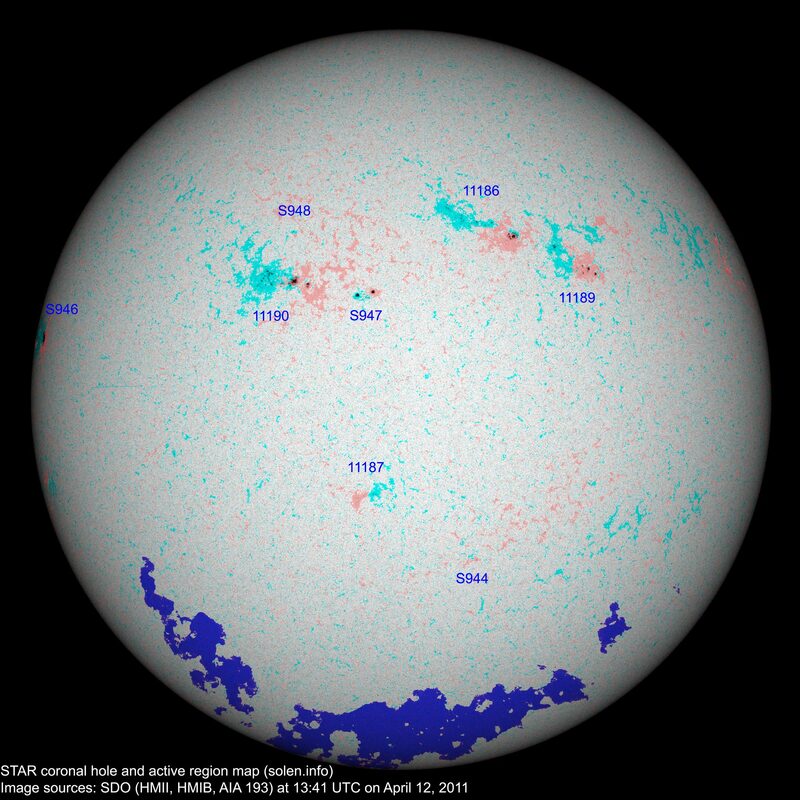 C flares are likely and an isolated M class flare is possible. Flares: C1.2 at 16:02, C1.8 at 20:30 UTC. 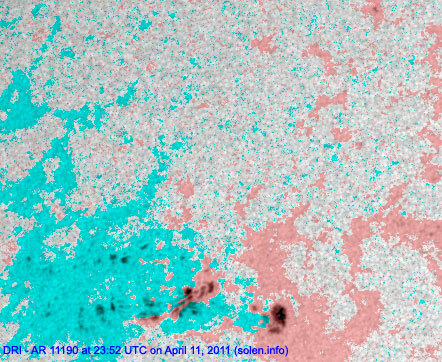 A C2.5 flare at 23:44 was attributed to this region as well, however, EVE images suggest the source may have been region S946. Minor update added at 14:40 UTC: The IMF at ACE was moderately southwards for several hours after 05h UTC. This caused active to minor storm conditions. 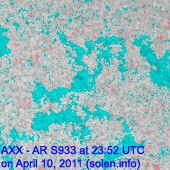 Otherwise new region S947 (located west of region 11190) emerged quickly early today. 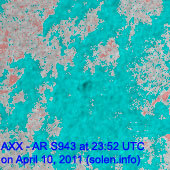 Region S948 was numbered as well (and should maybe have been numbered for yesterday's spot count, however, at the time it was difficult to be certain it was a region independent of AR 11190), while region S944 has reemerged. 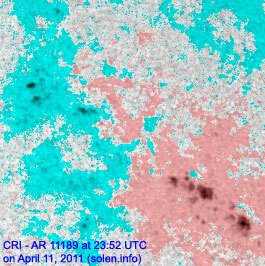 The latest high resolution STAR CHARMAP. 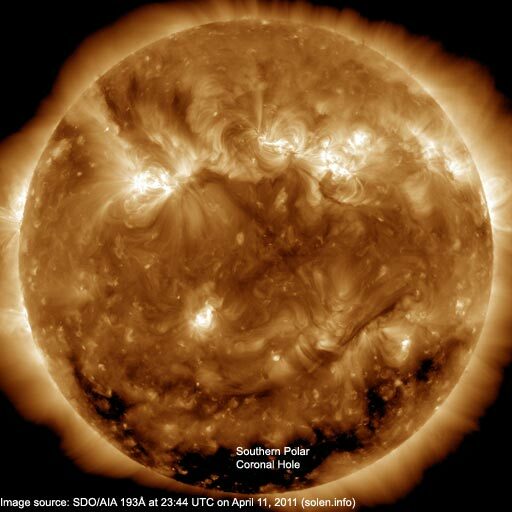 No obvious coronal holes are currently in or near Earth facing positions. 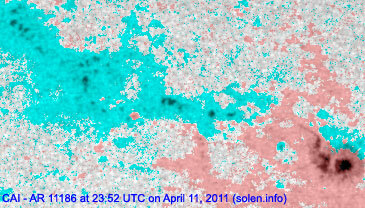 An extension (CH444) of the southern polar coronal hole was Earth facing on April 7-8. 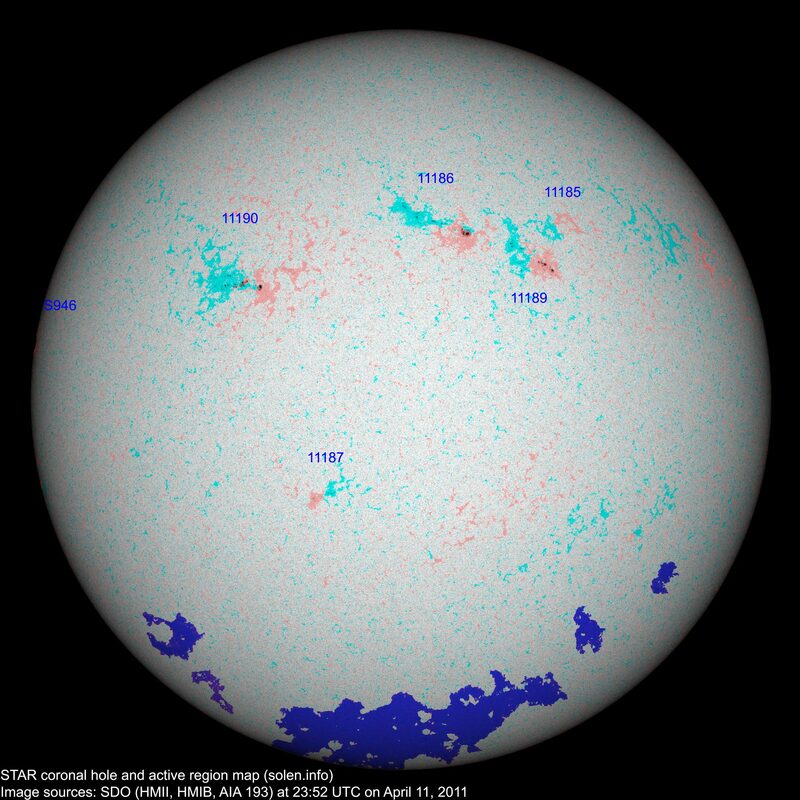 The geomagnetic field is expected to be quiet to unsettled with a chance of active intervals on April 12 and quiet on April 13-14.